It's time to eat! Why risk losing your parking spot for an off-campus trip when on-campus food options fill the need to feed? If you're going to eat while you’re on campus, here are some helpful tips. On the lowest level of the Commons building, the space formerly named Down Under now encompasses food from all over the world. 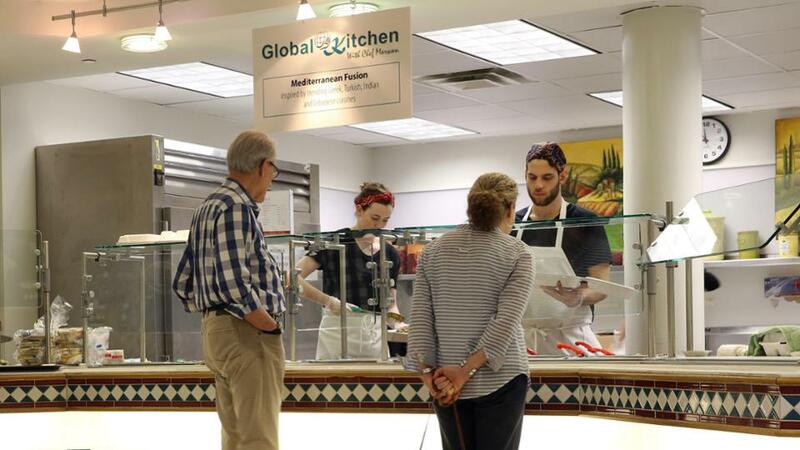 Chef Marwan Chebaro frequently ran a pop-up restaurant in the Food Court. His Mediterranean cuisine was such a hit that he now has a more permanent home. You’ll find for the best hummus anywhere. Also in the Global Kitchen is Chef Marc McCann’s Asian broth bowls. Create your own pho-like meals using your choice of protein (chicken, beef, tofu), vegetables and noodles. The tasty broth is vegan-approved! Try the restaurant adjacent to the NMOCA foyer. Its menu reflects a bit more sophistication (quiche, paninis, field greens, etc.) but is casual enough for students and staff as well as museum visitors. The atmosphere invites you to sit and chat. It’s also a convenient option if you’re in the Billington Library or Regnier Center. JCCC nutritionist Claudia Martin-Ayoade recommends the salad bar in the Food Court. "I eat at the salad bar every day because I can control my calorie intake with a meal that will fill me up and provide a variety of essential nutrients that my body needs," she said. "Plus, when available, we feature fruits and vegetables from the on-campus Open Petal Farm. It does not get more local and organic than that," Martin-Ayoade said. The salad bar is half price on Fridays, so an entrée-sized salad with all the toppings is a real steal. The biggest of JCCC’s three coffee shops has plenty of grab-and-go food, including sandwiches, salads and yogurt parfaits. Pick up a fruit-and-cheese cup for a tide-me-over or a muffin for an on-the-move breakfast. A Freshens Smoothie with a shot of protein powder also saves time over a sit-down meal. You can buy great coffee and tea drinks at all three JCCC coffee bars, but the second-floor location of ViBE means shorter lines. "We fill up quick during class breaks," said Jason Arnett, assistant manager for the Food Court and Coffee Bar Operations, "but we’re here to make your day better whenever you come by." All the coffee bars have muffins, pastries, fruit and snacks, too. Get a discount if you get a pastry and coffee together. Not a coffee fan? Stop by the Food Court from 2 to 4 p.m. daily for half-price fountain drinks. With Pizza Hut, Chick-fil-A and Firehouse Subs in the Food Court, you’ll find comfort in picking your favorites. Boulevard Burgers will grill you a burger in no time, and special orders at the other three storefronts only take six minutes, said Em Smail, Dining Services Supervisor. So, no pickles? No problem. This walk-up coffee bar is open 7 a.m. to 8 p.m. during fall and spring semesters. Get a snack and a drink there if you’re on campus in the evening. Of course, there are always vending machines, too! Get a discount on your purchases at JCCC Dining Services with the Dining Dollars program, and for the first time this year, dedicate a portion of your financial aid to dining! Bring your own reusable cup and get 30 cents off your fountain drink at the Food Court. Bring your reusable cup to the coffee bars and get two punches on your frequent-filler card. Cards are available at the register.